I have great fun with the Sketch challenges for they usually help me to think of doing something different and to slip out of a rut, for if your like me, I can easily slip into a comfort area and stay there, for instance most of my recent cards have all been square so it was a nice change to make a rectangle card. 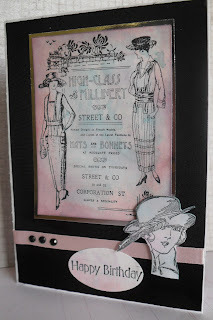 I have used a Crafty Inspirations stamp for the main image, I stamped it onto a piece of card I had previously prepared in my 'making backgrounds session' a few days ago. I covered the page with TH Distress inks, Worn Lipstick, Victorian Velvet and Broken China, I then sprayed water on it , left it for a few minutes, rolled a kitchen towel roll over it. 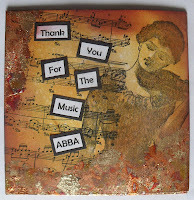 I also used a free stamp from the Craft Stamper magazine,added ribbon and gems with a greeting. Have fun with our sketch, I know I will enjoy visiting you over the next week. Use It Tuesdays this week have challenged us to use up some of our reds, oranges and yellows to warm up our winter days. I made this Fat Page for the Do Crafts Fat Page Swap I organise, for this month's theme, which is Words and Music. Being a Fat Page it measures 4" x 4" which I keep in a book. 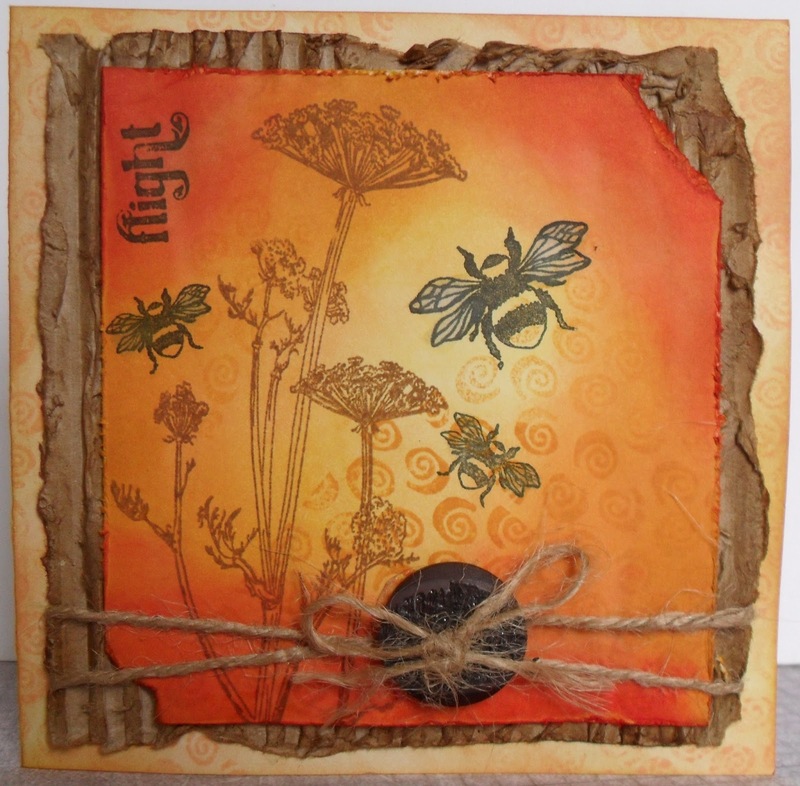 I used warm colours from the Distress Inks range from TH. The music stamp and the pretty violinist are from La Blanche. 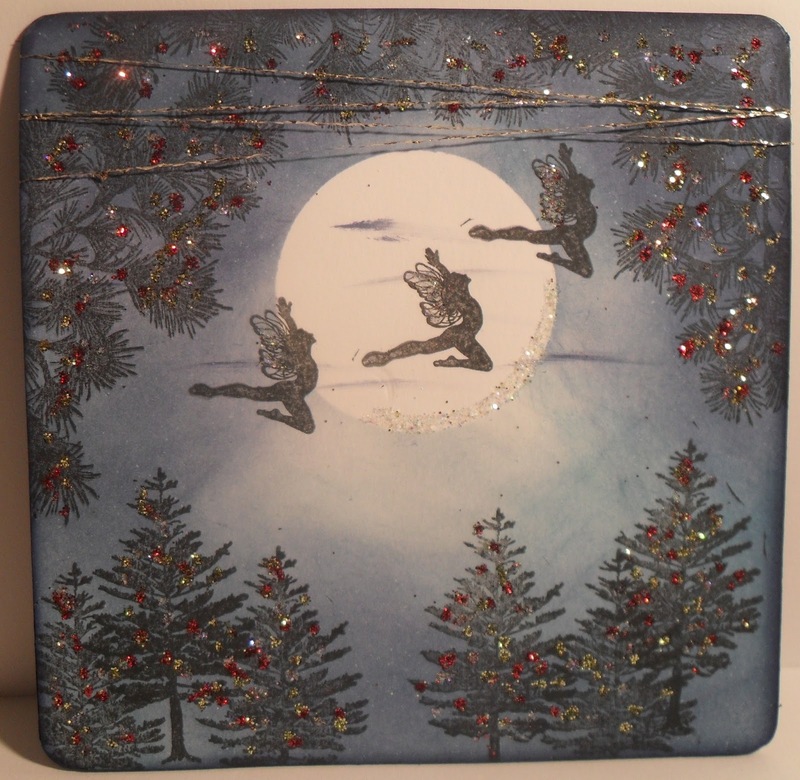 to add a touch of richness to the back and front I added a little of my own Pot Pourri mix of gilding flakes. 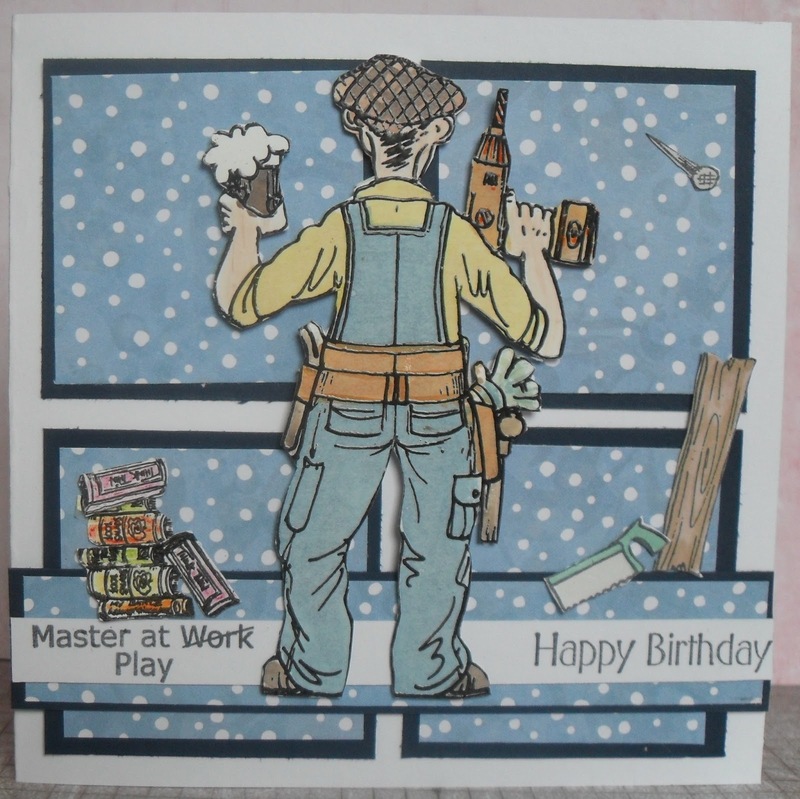 Another fabulous response to last week's challenge at Make My Monday, we are always looking for cards for men, so here we are, your challenge if you accept it is - 'One For The Boys'. Now this can be for an old boy or a young boy, for really men are only boys in a larger body aren't they? I feel I can say this with authority being one of 8 females in a family with 15 (boys) men. 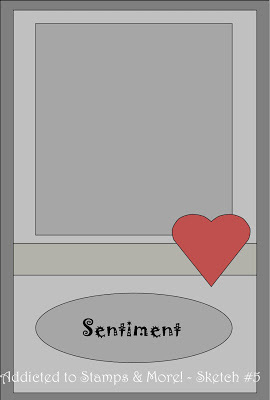 I felt like having a messy afternoon, so made some backgrounds, from which I used this one for the card. Started as a white card, covered with several Distress inks, then splashed around with a few similar H2o's to add bling, I don't think the bling shows here. The stamp is a Butterfly Kisses - Nautical from Hobby Art, along with the sentiment, I was lucky to win these in a challenge last year. 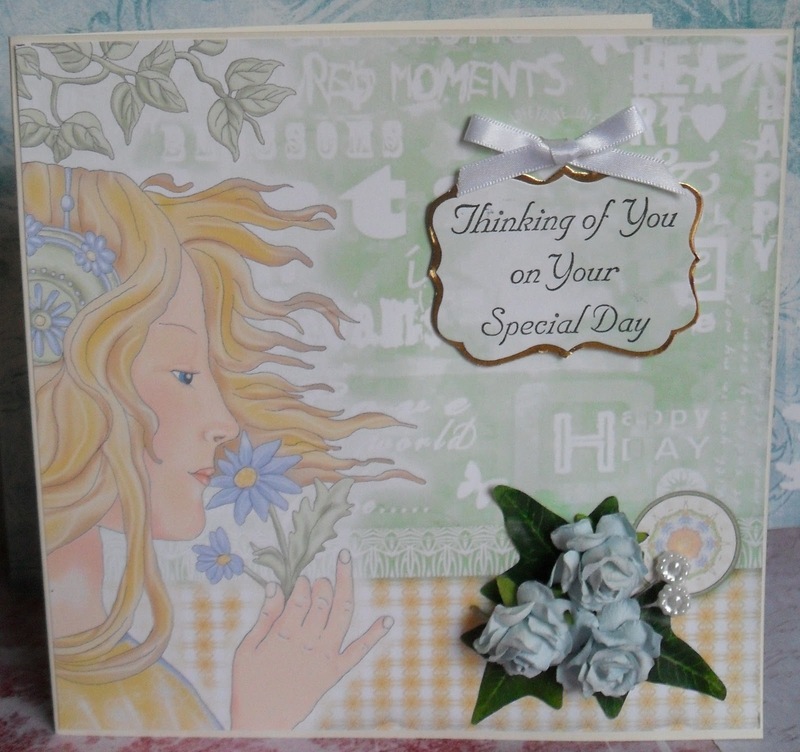 Have fun making your card, looking forward to visiting your blog and thanks to those who have visited me, it is always appreciated. 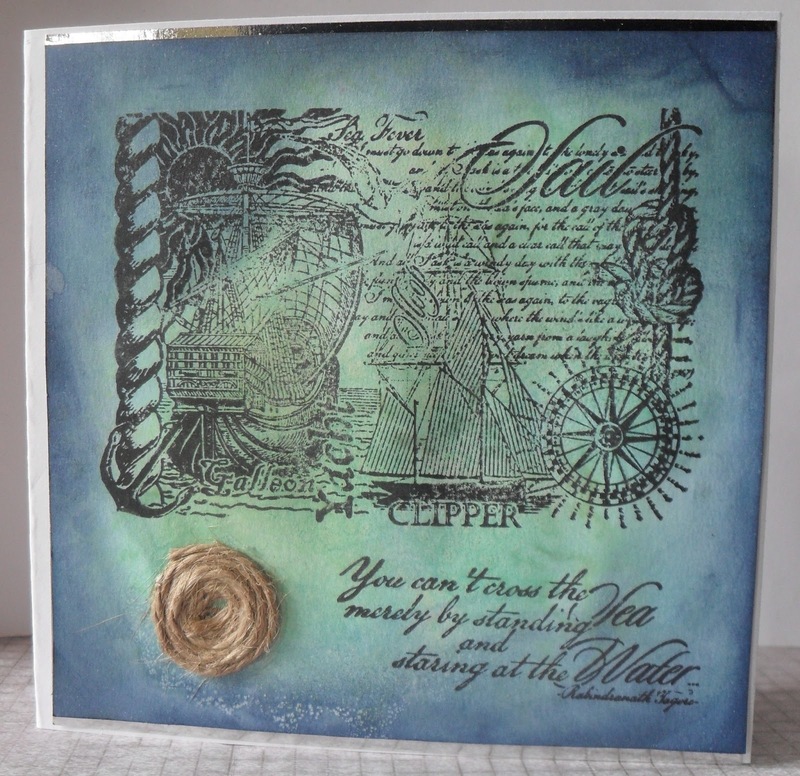 I am also entering my card into Cards for Men challenge #2 Transport- Sailing and clipper ships. 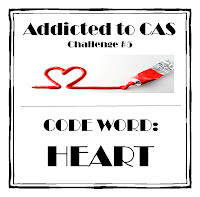 I so much enjoyed last week's challenge with Blue Jeans, at CD Sunday Challenges, so many really good entries. Pleased I don't have to choose the winner. 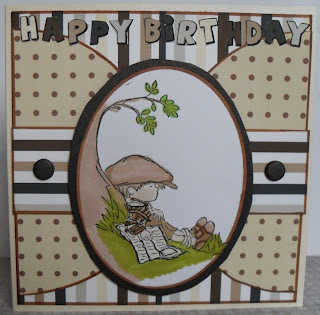 For this week the challenge is called Hello Doily, the challenge to use in your design a doily, not too difficult, for they are now very popular for use on cards, not so sure with cakes and buns as in days gone by. 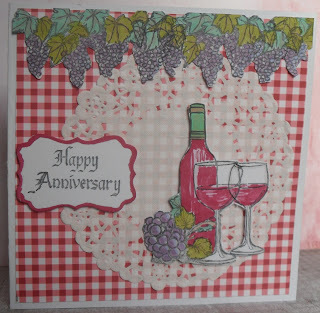 I do like to use up something from my enormous pile of leftovers whenever I can, the red gingham card, from Painted Poppets CD was the inspiration for my card. 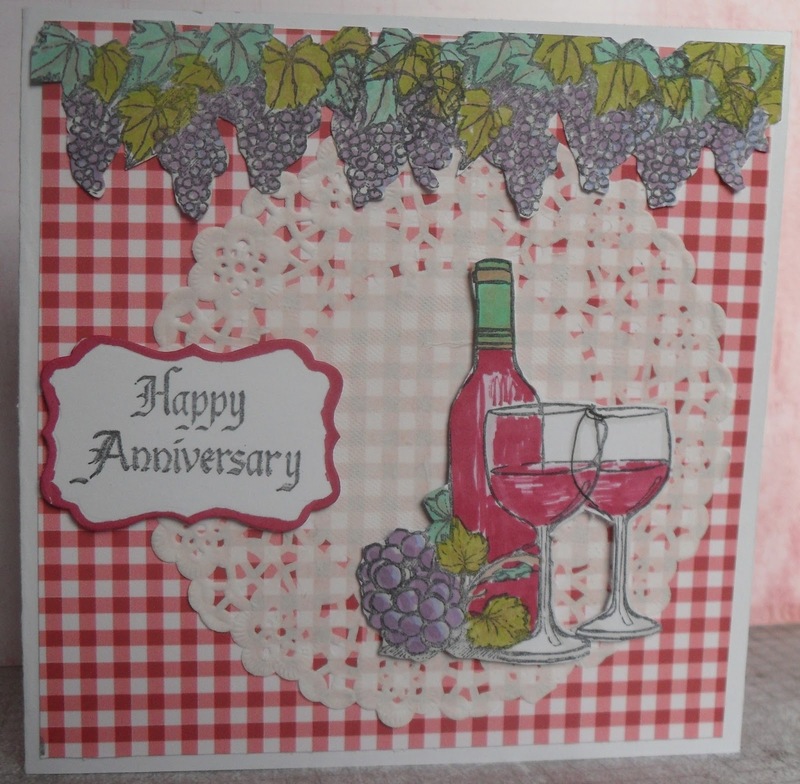 The grapes and wine stamps are from Sheena, produced by Crafter's Companions - A Little Bit Scenic - Provence, coloured with Promarkers. 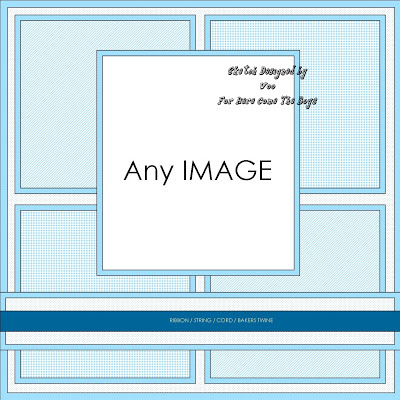 The design time have mazing variations on the theme, please do pop over and if you haven't ventured to enter a card, all you have to do is include something from a CD, it doesn't have to be all of the card as I have shown. Have fun and thanks for your visit. 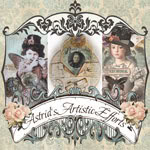 This week we are so lucky to be sponsored by Andrea over at Annabelle Stamps!! Andrea has offered a $10 discount voucher at her store!! 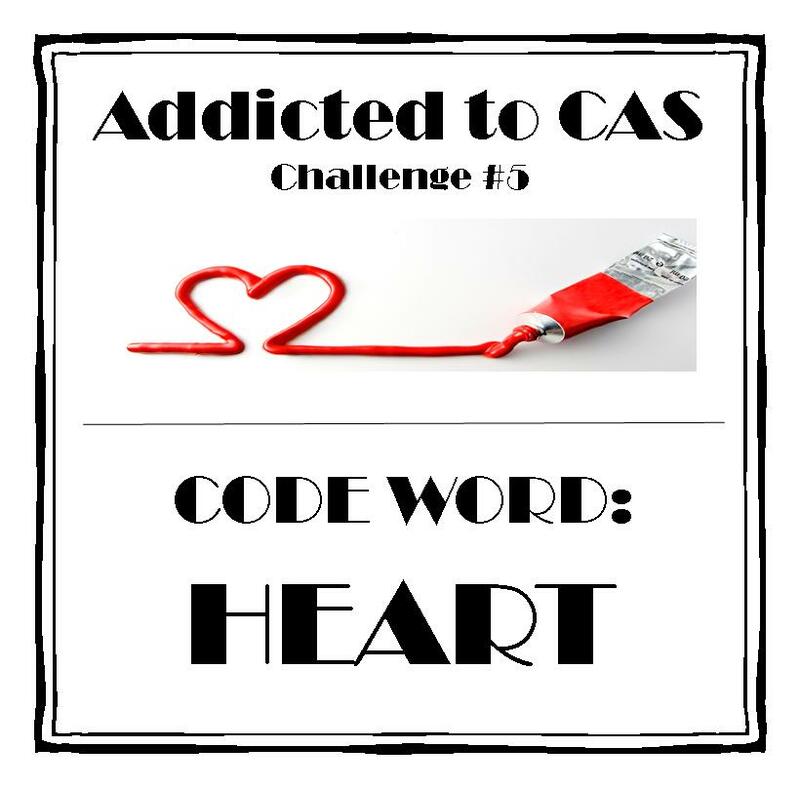 Our Code Word for the next two weeks is HEART - at Addicted to CAS. Of course it must be CAS - you can make your project for any purpose for any genre, but it must be Clean and Simple. 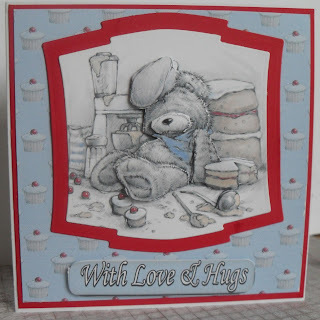 For my card, I have used a favourite heart stamp, it is from Chloe Stamps. I embossed the heart with Wow! 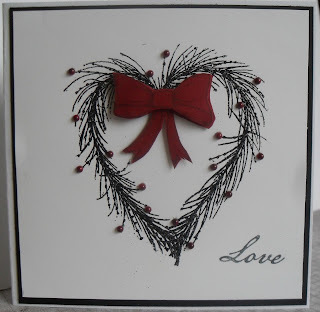 Black Tinsel powder, added the stamped red bow and small red gems. One word for a greeting says it all - Love. Argghh!!! keep warm everyone, I'll be visiting you over the next two weeks, loving your hearts. At I love Promarkers it is challenge #152 Anything Goes, this is my second entry. The card matches the bag featured below, in my first posting. I am entering both projects. 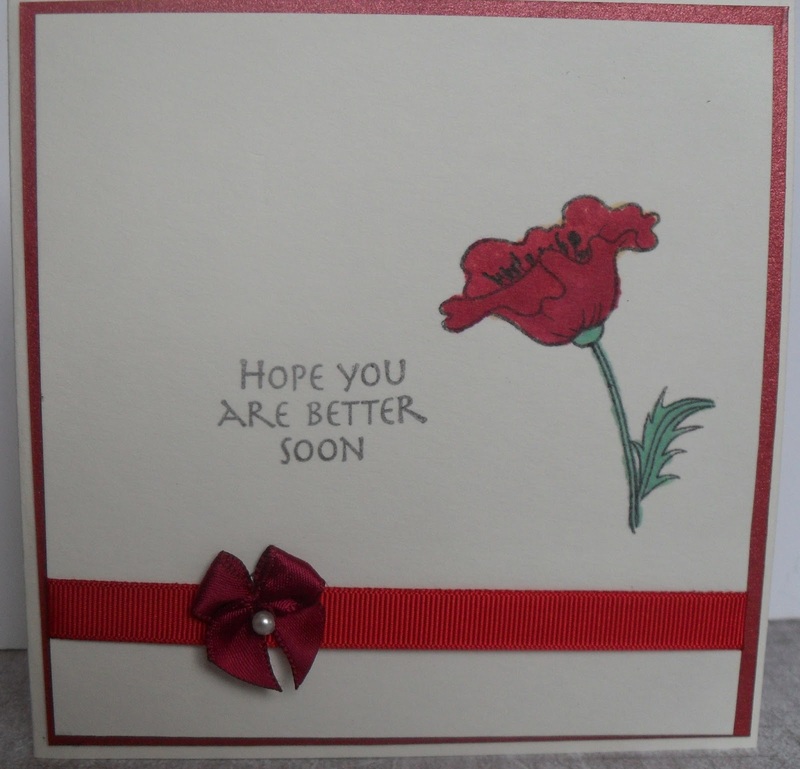 I again used for the main image a stamp from Crafty Sentiments, added a shrivelled bow, punched flowers with gems and a greeting. I just love the colours of the papers which form the background. Thanks to anyone who visits me and especially to those who can leave a comment. I love Promarkers challenge #152 is Anything Goes - I am currently working on a commission for a friend who is needing some samples for her trade stand. 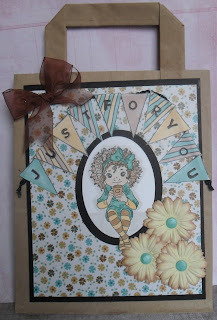 I decorated this bag with her paper and used Promarkers to colour the banner and the main image from Crafty Sentiments. I have also made a card which is in my second post today. I was slow to discover how wonderful Promarkers are but after watching a few very helpful videos on various websites and You tube, I am growing to appreciate them more and more. Hobby Art Ltd. poppy Scene-It. I look forward to visiting you once again over the next week, if your in the UK please do wrap up, stay indoors as much as you can, keep warm and have fun crafting. we are pleased we are once again sponsored by Bugaboo Stamps more details on our challenge blog. Yes, it is time for another sketch at Make My Monday, simple but when you pop over to see the samples from the Design Team you will see how effective the simple can be. 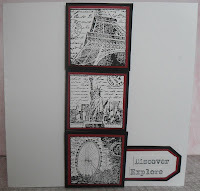 For my card I used travel as my theme. 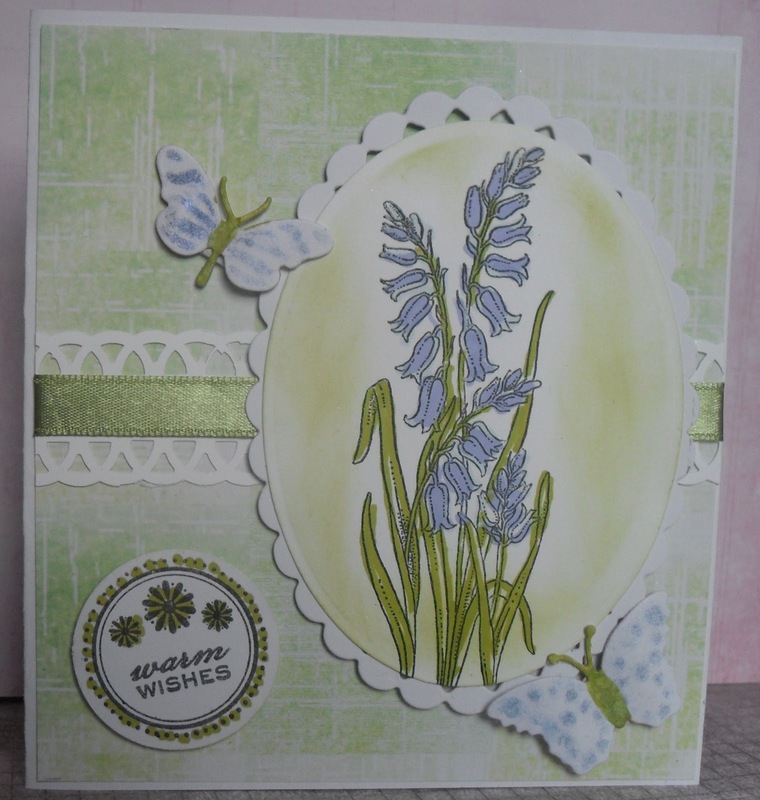 I have used a Crafty Individuals stamp CI 228 , and decided to keep it limited in colours. We are always trying to find suitable cards for men, this would certainly be useful. I look forward to visiting you over the next week, it has been so exciting visiting so many entries, thanks for your interest. Hello to all of our CD Sunday Challenges Followers. 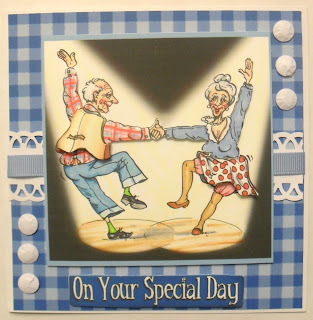 I suppose I could be referred to as a 'Wrinkly' for I well remember my hubby and I dancing as above, but he didn't wear jeans. Yes, it's the jeans we are after for this week's challenge. Anyone wearing jeans or anything related to jeans. Have fun, I'm sorry I didn't get many comments completed for last week, I was a little poorly, am fine now. Hoping to get round to see you all this week. My card was made from The Best of La Pache 2012, I was lucky to get this and another at a reduced price, I so love a bargain. Elements added, a punched strip using an X-Cut Lace Trim punch, ribbon and white Card Candy. Take care everyone in the bad snow conditions and do keep warm. Good morning everyone, nice to be back again at Alphabet Challenges, only a few more letters and we'll be kicking off for another round of the alphabet. For the next two weeks we will be looking for your projects which fit Sheena's choice for the letter Y - Yummy, so we want to see Food. For a change I have made a card from a CD - La Pashe best of 2012, I bought it at a craft event on Sunday, for I especially like the section with Pickles and Podge such adorable Teddies. My only addition to this card is the main card and the red backgrounds, but it was quick, easy and I think real cute. 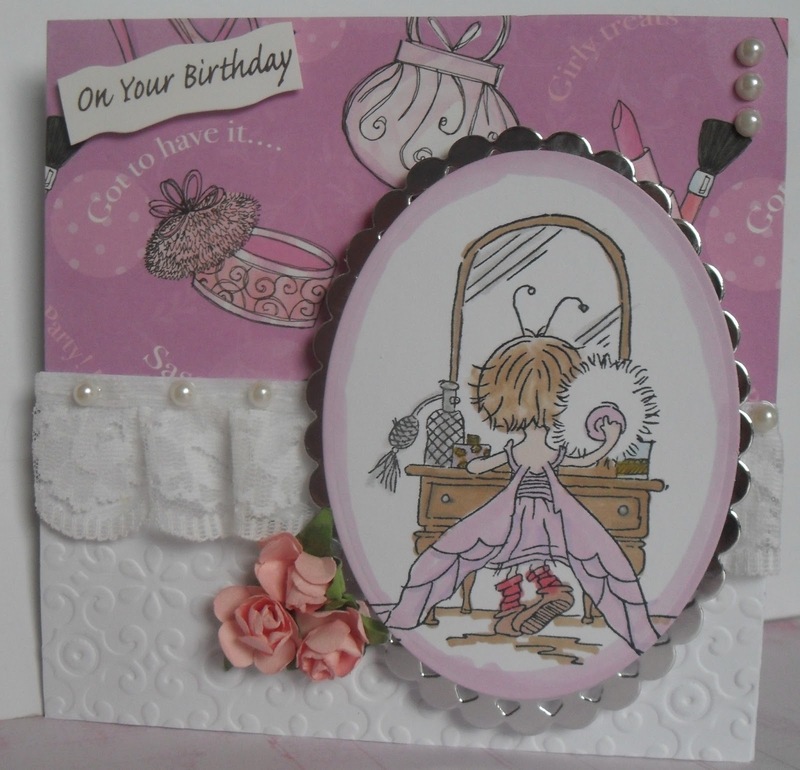 I look forward to popping onto your blogs to say Hi and comment on your Yummy cards. Have fun. Crafts and Me Challenges are appropriately starting up after their holiday break with challenge # 116 - Something New - to use anything new we may have got from Santa. From some money I was given at Christmas I was thrilled to buy this delightful owl stamp from Little Claire at a recent Ross Papercraft Show. I also found some gorgeous backing papers from the Patsymay stall. The branches are from a Martha Stewart punch, not new. The owls image has been coloured with Promarkers, I was lucky enough to receive a Limited Edition of Seasons Promarkers, wasn't Santa kind. Happy New Year to everyone at Crafts and Me. Labels: Crafts and Me, Little Claire, Thank You Card. Addicted to Black and White. For our Addiction to Colour week, we have a favourite Black and White at Addicted to Stamps & More. 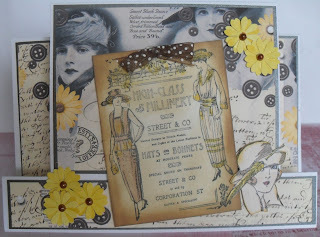 Please pop over to the blog for full details and of course to see the splendid samples from the Design Team. Our amazing sponsor this week is Bugaboo Stamps!!!! 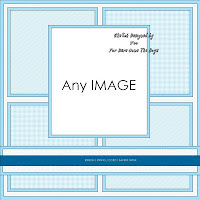 They are generously offering you a pack of 7 digi's from their store!!! 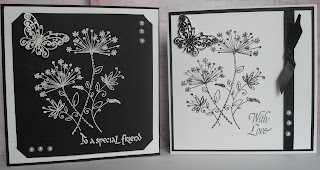 For my cards, I couldn't decide between Black and White or White and Black, so decided to show both to see the difference between the two.On the card on the left I embossed the Flying Stars stamp from Penny Black, with Detailed white powder from Stampendous, as well as the butterfly a freebie with Craft Stamper. On the card on the right I embossed with Black Tinsel WOW! powder to the stamps. 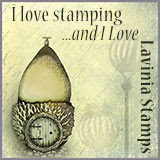 I hope you like them, for this is probably the most expensive stamp I have ever bought but it is one of my most favourite, for it is so versatile. I look forward to visiting you over the next week. Hello everyone again. This week at Make My Monday, it is the turn for Fliss to choose the topic and she has chosen another popular theme Die Cuts and or Punches, whichever you choose, or even both. We would love you to take part and have fun. 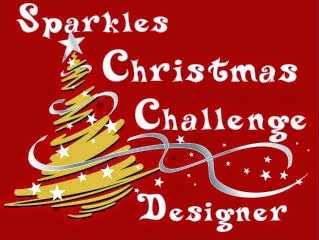 Please pop over to our blog for more details and of course to see the lovely projects made by the DT. This is my card, I used both dies and punches. Centre punched Panel both sides punched with an X -Cut lace trim. Green ribbon added. Butterflies are Marianne Die cuts. 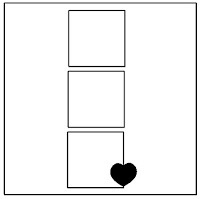 Greeting circle is a stamp -Personal Impressions -punched with a circle punch. Oval Die and a Nellie Snellie Patterned Oval Die. 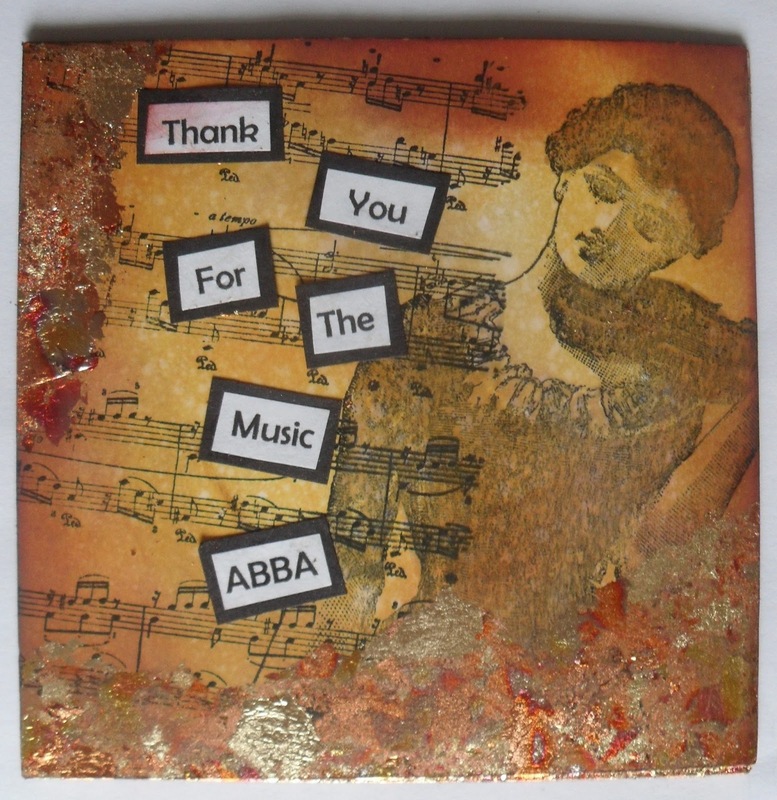 Thanks for any comments you may leave, I will be popping onto your blogs and leaving a comment. Labels: Chocolate Baroque, Make My Monday, Marianne Dies, Nellie Snellie die. 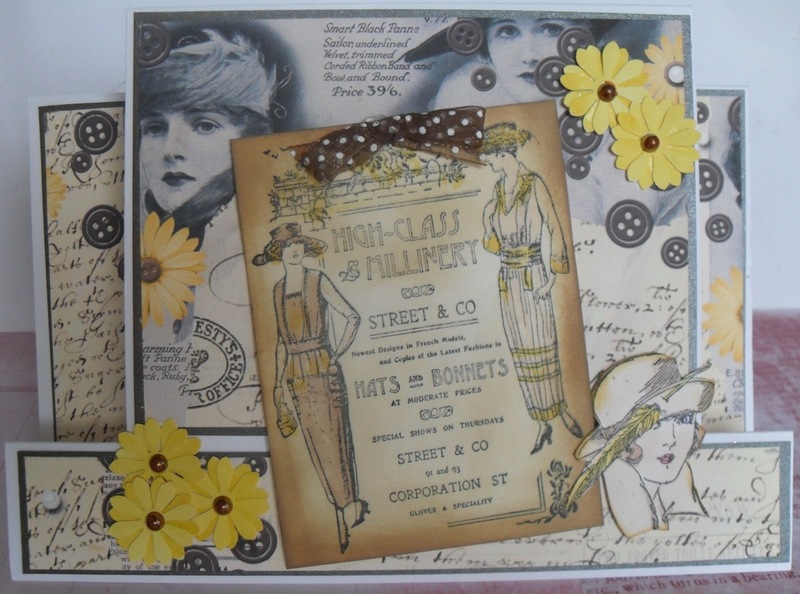 Hello again and welcome.This week at CD Sunday Challenges, it was Jenny's turn this week to choose our challenge, she choose a favourite of mine, Vintage Vogue, I love anything to do with fashions of the past. 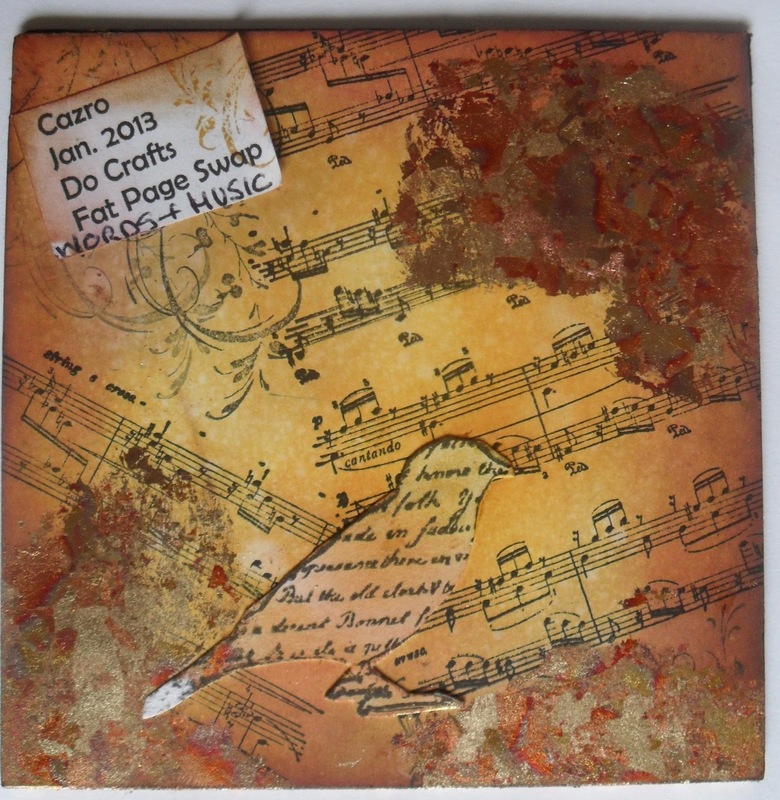 A perfect CD which suited this challenge for me is Debbie Moore Shabby Chic - Haberdashery, all the background papers are from there. The stepper card is one I made from a Rob Adams CD Fabulous Folds. 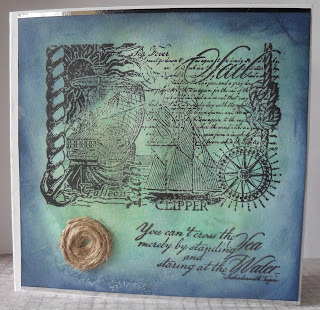 The stamped centre image is from Crafty Individuals, the lady with the feather was a freebie with the Craft Stamper magazine. I once again look forward to visiting and commenting on your entries, have fun everyone. Second Post Today. Daring Cardmakers challenge this week is ' The Frill Of It All' - terrific title asking for a frill to be added. 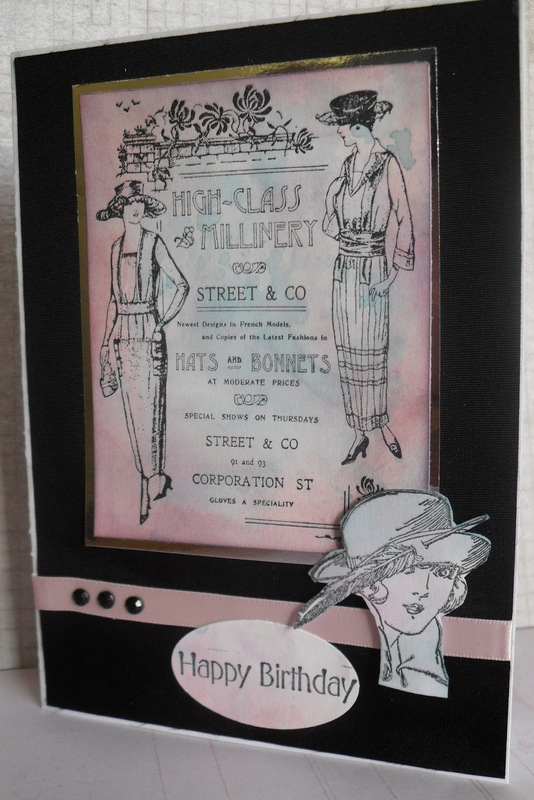 here is my card, I never was a cutie person but there are some makers of stamps out there who have managed to entice me into a different world of card making for me. I couldn't resist this adorable stamp from LOTV, which was coloured with Promarkers. Thanks for an interesting and different challenge. 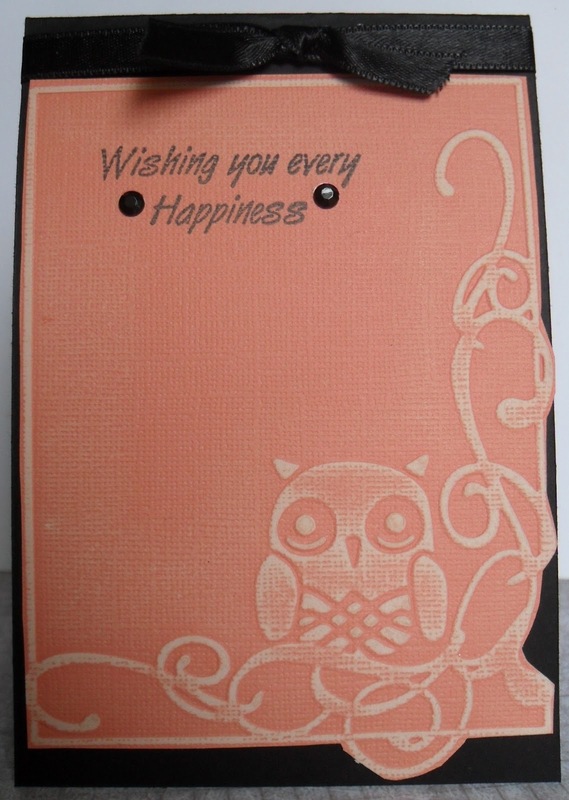 EMBOSSING -You can do either dry or heat embossing it is your choice. with a wonderful prize for our winner of the challenge. 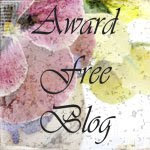 Please pop over to the blog to see more details. 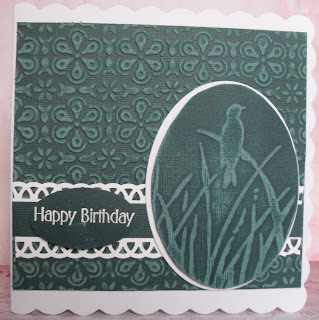 For my CAS - Clean and simple card, I decided to use a Cuttlebug embossing folder. 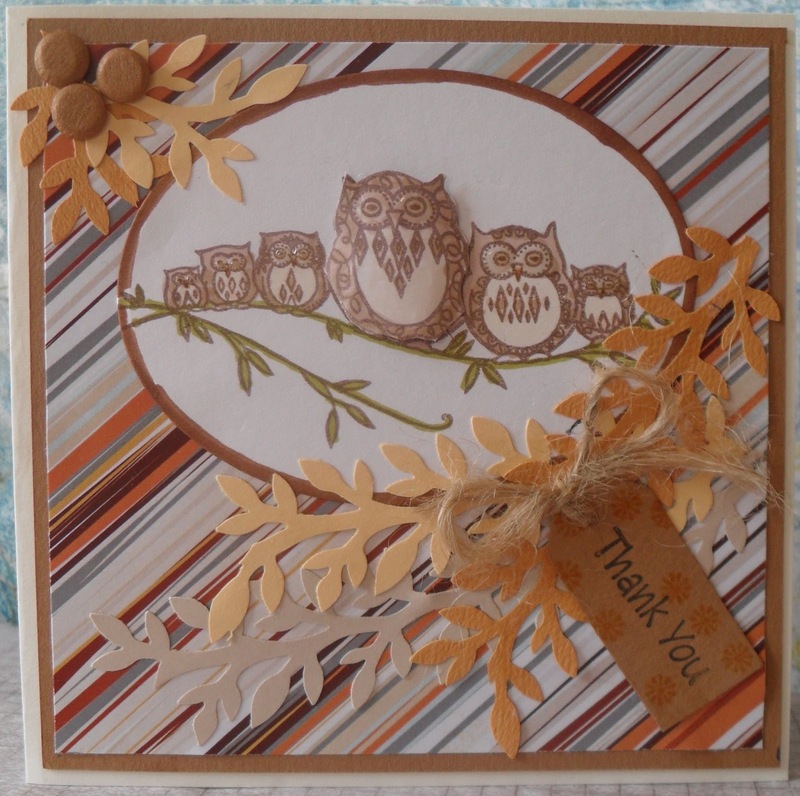 Owls are so cute and can be used for various occasions. I used an orange sheet of Core-dinations, once embossed I sanded the embossed area which gives it the lighter colour. 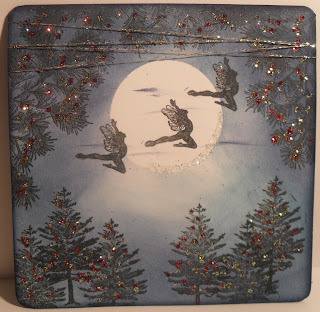 I then mounted it onto a C6 card (approx 6 x 4") and tied a black ribbon across the top. The greeting is one of those lucky pick ups from a reduced box. 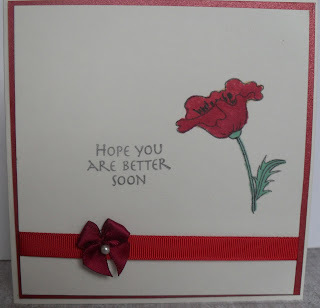 I am looking forward to visiting and commenting on your embossed cards over the next two weeks. Thanks to those who have visited me and for any comments left which are always appreciated. Welcome to my newest follower, it is always heart warming to see another face appear in my list of followers. I hope everyone have had a super Christmas, that Santa was kind to you and maybe you have some new crafty bits your longing to play with. 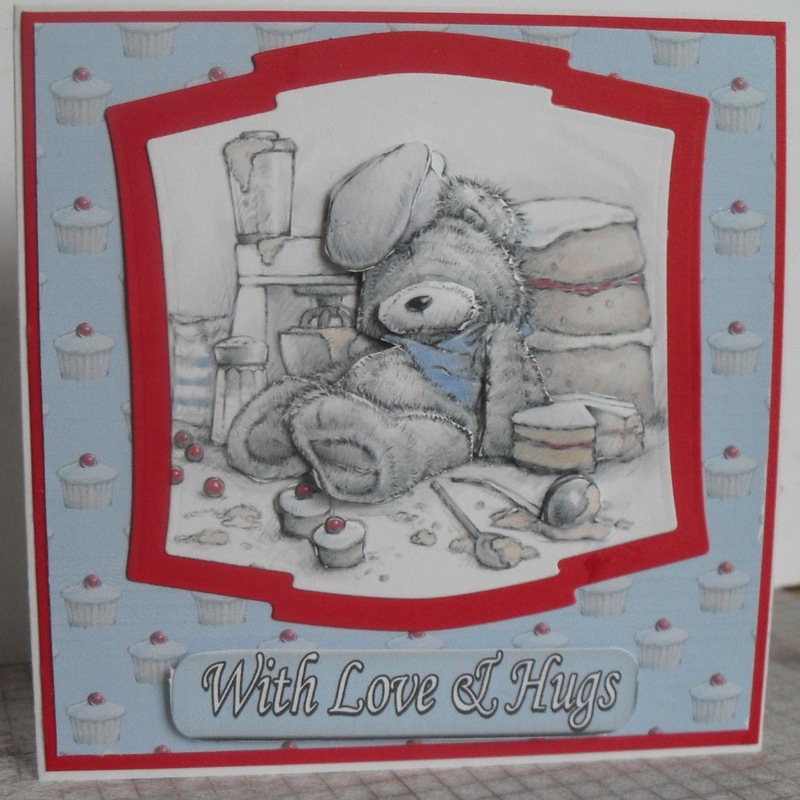 We at Addicted to Stamps and More have had a super break, I wish all my visitors a very happy New year. 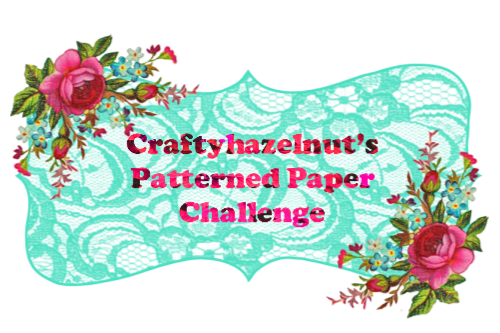 It is now time to get back to crafting and challenging, thank goodness, for I do enjoy these challenges and to visit your blogs, glad to get back to normal. image of the plant is from Indigo Blu stamps. Tied with a piece of twine and a button. 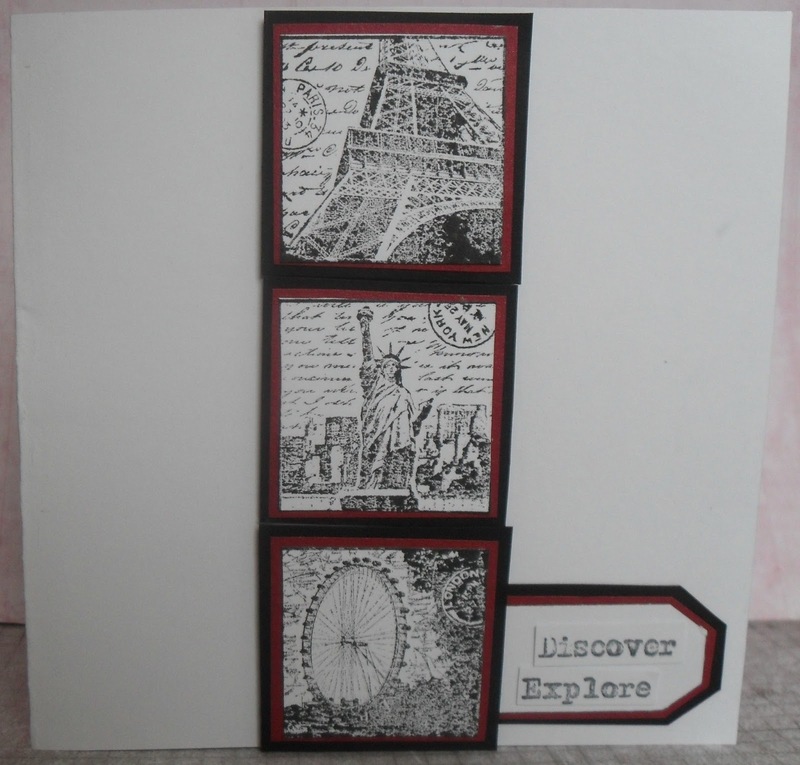 Some of the design team have used Bugaboo Digi Stamps, others have used a varied collection of sources. Have fun, I look forward once again to paying you a visit over the next week. Am I odd? 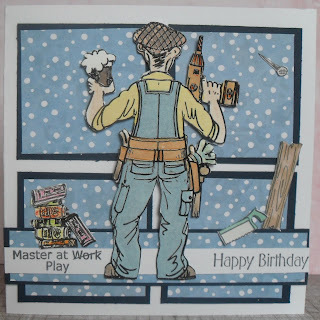 I do sympathise with those who seem to struggle making men's cards. Maybe because I being female are in the minority in our family, we few ladies and girls are surrounded by an army of men and boys. The male image is from the Flippen men series which I thought suited this design, for I see him as beginning to add a shelf to the wall, but of course being a man he is thinking about it with a pint in his hand. All coloured with Promarkers. Welcome back to Make My Monday, we have had a wonderful break, sadly, some of the DT have been ill with colds and flu, hopefully they are all now on the road to recovery. Not a good start to the new year, but I send to all the followers who enjoy the challenges at MMM a very happy and healthy new year. We have decided to make a few changes which start in the New Year, we no longer will have a theme per month, we will be more of a mixed bag every week, with challenges to hopefully interest and inspire you. 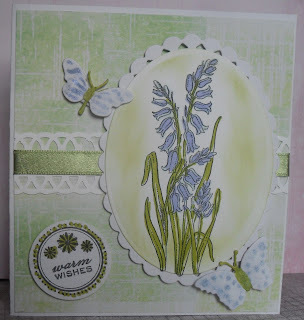 We are starting off with Dry Embossing - a very pretty and now with Embossing folders, an easy technique. I have used Core-dinations card, I love it. 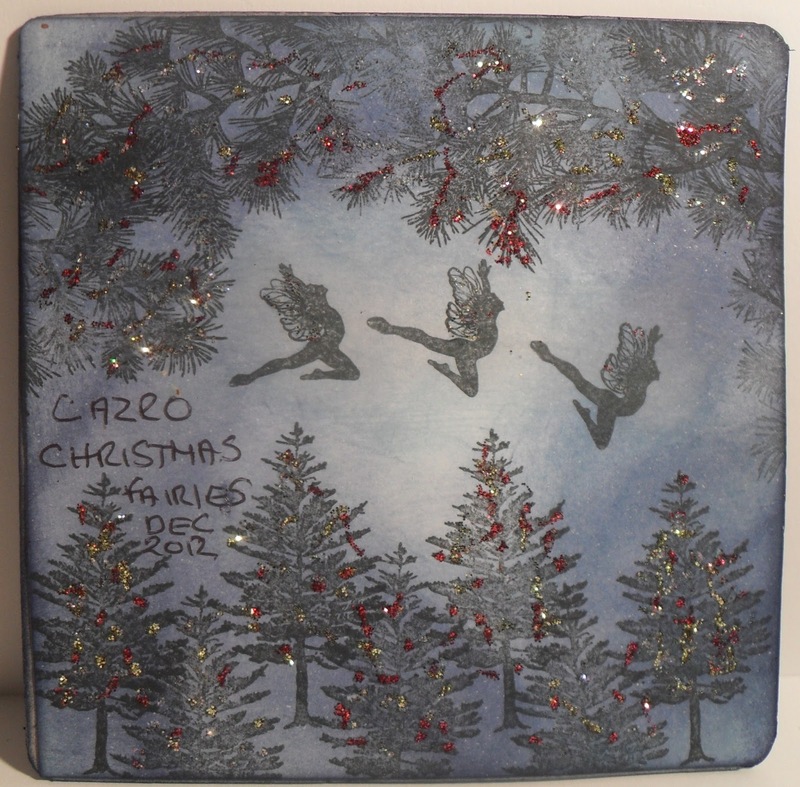 It produces a wonderful effect when embossed and sanded. I used two embossing folders, one for the background and one of the grasses and bird, punched out with a die. I used a lace trim punch for the white lacy border. If your a new crafter or received some new tools from Santa, please look in on us regularly for the Design Team will be producing some amazing samples in months to come from which you can learn and hopefully be inspired. 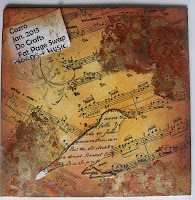 Since October 2011 I have been hosting a Fat Pages Swap on the ATC Forum on Do Crafts Website. Sadly the regular numbers over the time is starting to dwindle. So I have decided to open up the swap, however if your aren't already a member of Do Crafts you don't need to be. If you wish to join in then all you need to do is follow the rules, I will add a page above, and post to me before the closing date. January Words and Music, February - Butterflies and march is childhood Memories. The above are pics of my December swap - Christmas Fairies. 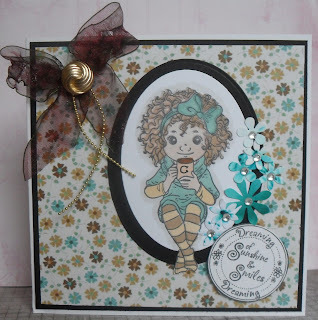 TH Distress Inks Broken China and Chipped Sapphire, Sheena Douglass- Pinescape stamps and Fairy stamps. Silver red and green glitter, applied with a Quickie glue pen. What are Fat Pages? See above on the Pages list. I would be thrilled to welcome some new participants. 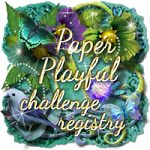 This week, we at CD Sunday Challenges - Art Nouveau - have a Floral Jewels CD prize for you which has been kindly donated by Sarah Hallum from Peerless Designs. All of the designs produced by the Design Team are from the CD Floral Jewels. 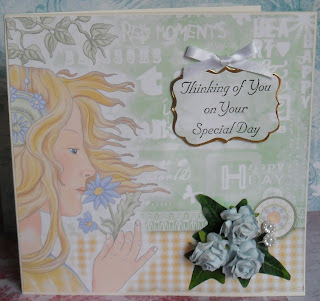 My 8" square card features a scrapbook page from the CD, I added a ribbon bow, greeting, flowers and leaves to embellish. I look forward to visiting you all once again. Welcome to Alphabet Challenge, I wish all of my visitors and followers a very happy New Year. I know many who have not had such a wonderful past year, so to everyone, I wish for you good health and happiness. We have a few more letters of the alphabet to complete before we start all over again. For the letter X - Shaz has chosen X - marks the spot - yes, we would like to see Spots and Stripes. The rest is up to you. Have fun when making your project. All of the background paper including the Happy Birthday letters are from a Funkyhands Happy Birthday CD. The main image is an adorable stamp from LOTV, which has been coloured with Promarkers. I can later add a number for the age, once I know who it it will be for.